Luxury skincare, inspired by Geisha beauty rituals. Remember when you first heard of Tatcha years ago? I do and it was their little parcel of delicate wrapped high end blotting sheets. 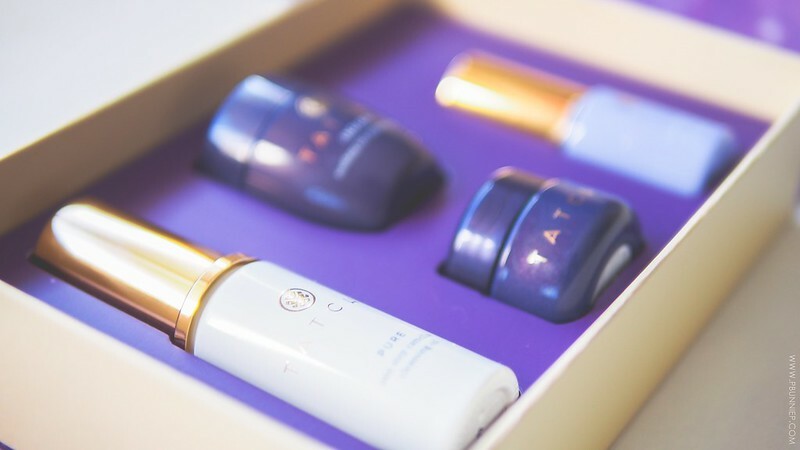 Today, Tatcha has built on that reputation as a sought after name in high quality luxury skincare with a naturalistic approach. Founder Victoria Tsai was inspired by the ancient beauty rituals of Geishas she met on a trip to Japan and decided to build a skincare range based on simplicity and time tested ingredients. I have been doing a test run of their Sensitive Ritual Discovery Kit* for the last two weeks. The four products paired here are meant to help calm, soothe and hydrate the skin. 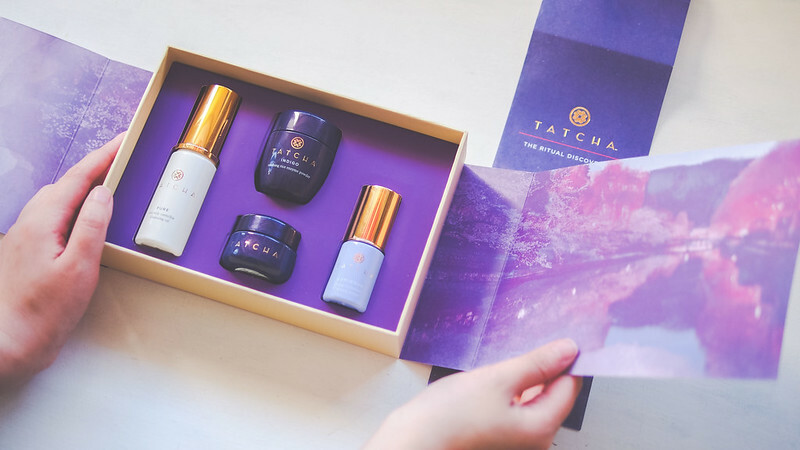 There's no denying that Tatcha takes great care and pride in their products, from the presentation of the box to the real glass packaging used for the travel set, every detail looked purposeful and well thought out. Reaching for these minis actually felt like I was embarking on a spa ritual. Let me talk you through the products. Lightly scented, this indulgently smooth cleansing oil has just the right consistency to spread well but also feel cocooning on the skin and is a welcomed experience at the end of a long day. Having used my fair share of oils, I'm actually incredibly impressed at the perfect balance between texture, emulsibility (translation: super easy to rinse) and it's effectiveness at removing makeup. But my favourite part is how lovely, soft and smooth this left my skin after just the first wash and there was no residue whatsoever. In fact, I actually said "wow" out loud in the mirror. That should mean plenty. As one of the brands iconic products, this was one of the first cleansing powders out on the western market years ago so I was thrilled to try this out. A fine grit powder works into a creamy wash when in contact with water (no bubbles here) and provides an ever so slight bit of exfoliation. However there was nothing really miraculous after the newness of the powder mixing fun wore off. I found the wash to be too light and didn't satisfy my lather cravings. Perhaps I wasn't using enough? It wasn't drying and rinsed off easily with warm water but that's about all there is to say. There was nothing particularly wrong with it but yet nothing worth raving about either. I washed, I dried and I moved on. Oryza Sativa (Rice) Powder, Microcrystalline Cellulose, Potassium Myristate, Polygonum Tinctorium (Japanese Indigo) Leaf/Stem Extract, Indigofera Tinctoria Leaf Extract, Colloidal Oatmeal, Camellia Sinensis (Green Tea) Leaf Extract, Hydrolyzed Conchiolin (Pearl) Protein, Oryza Sativa (Rice) Bran, Algae Extract, Glycerin, Potassium Sorbate, Sodium Benzoate, Calcium Carbonate, Titanium Dioxide, Tin Oxide, Mica, Alcohol, Phenoxyethanol. Luminous? Hydrating? Yes, yes, YES! 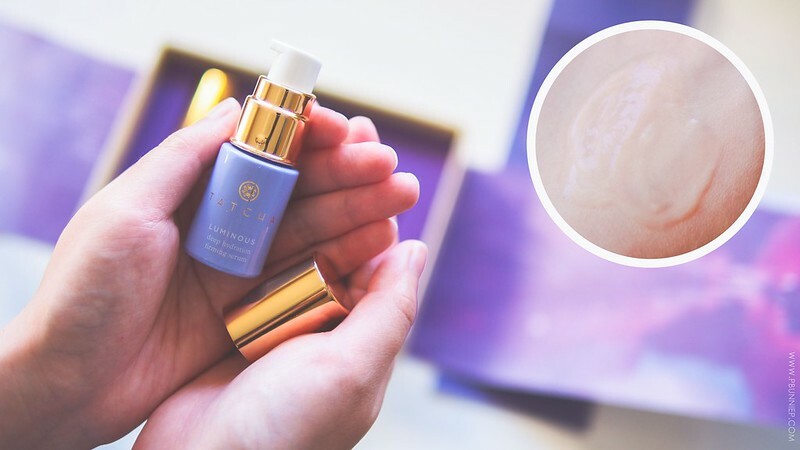 Formulated with Okinawa red algae, (my fav) hylauroinc acid and fine 23K gold shimmer this serum is meant to smooth, firm and illuminate the skin. Used together with the cream (as instructed) it was much too hydrating for my combination skin and even when used alone it felt too sticky to be enjoyable. As I'm warming this between my hands I did wonder how much of the money is going to the artificial brightening from the 23K gold. And while I enjoyed the amazingly silky texture of this serum, it just wasn't quite right for me. Those with very dry skin and/or noticing the first signs of wrinkles may find this better suited. Water, Glycerin, Propanediol, Chondrus Crispus Extract, Alcohol, Methyl Gluceth-20, Polyglyceryl-10 Eicosanedioate/Tetradecanedioate, Carrageenan (Algae Extract), Fragrance (All Natural), Inositol (Rice Extract), Polyglyceryl-10 Myristate, Titanium Dioxide, Sodium Hyaluronate, Sericin (Silk Extract), Stearyl Glycyrrhetinate (Licorice Extract), Silica, Hydrogenated Lecithin (Soy Origin), Squalane (Olive Origin), Sodium Dilauramidoglutamide Lysine, Camellia Sinensis Leaf (Green Tea) Extract, Royal Jelly Extract, Algae Extract, Chamomilla Recutita (Matricaria) Flower Extract, Gold, Sodium Bicarbonate, Xanthan Gum Crosspolymer, Ethylhexylglycerin, Phenoxyethanol, Butelyne Glycol, HDI/Trimethylol, Hexyllactone Crosspolymere, Synthetic Fluorphlogopite. FORMULATED WITHOUTParabens, mineral oils, synthetic fragrances, sulfate detergents, urea, DEA, TEA or phthalates. If I had a million dollars... I'd use this cream every single day. (Can you name the sneaky reference I made there?) 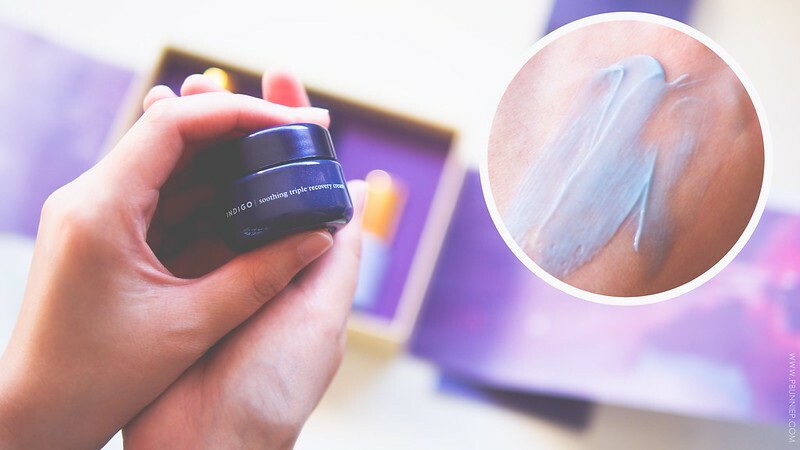 It's ironic that the products I initially lusted after had failed to impress me but this strange looking blue cream has won my heart and future bank account. 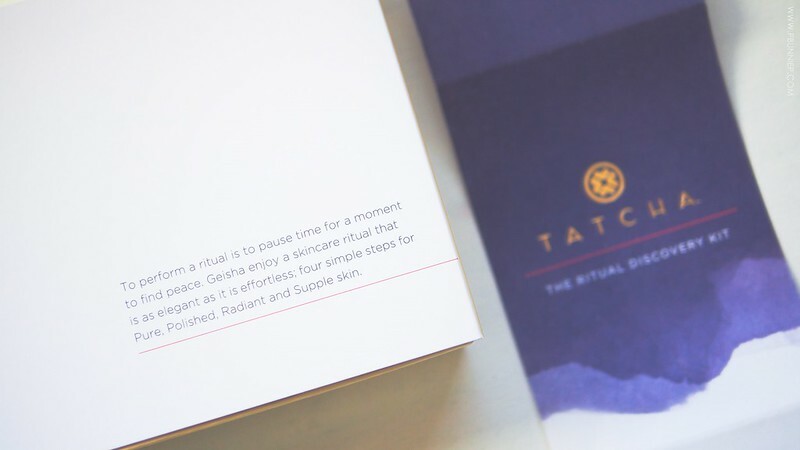 According to Tatcha, indigo was traditionally used in Japan as a healing ingredient and especially by warriors. Here in this little jar, I found a smooth, soothing, hydrating cream that not only left my skin supple right after use but actually made me admire my skin the next morning. Yes, admire. I'm also not ashamed to say that when I put this on the night before, sometimes I merely just rinse my face with water (put some more on) and be on my way. 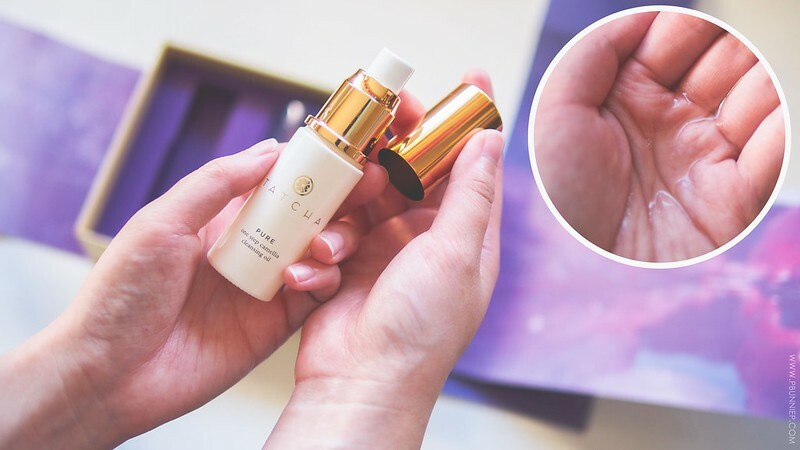 Even though I've only been using the travel size, I've noticed a reduction in dry patches, an increase in firmness and it's seemed to help with redness as well. The texture is also perfect for this time of the year on my skin type but this might be too rich for very oily skins. Inactive Ingredients:Water, Squalane (Olive origin), Glycerin, Propanediol, Cyclopentasiloxane, Diisostearyl Malate, Oryza Sativa (Rice) Bran Wax, Xylitol, Behenyl Alcohol, Polygonum Tinctorium (Japanese Indigo) Leaf/stem Extract, Indigofera Tinctoria Leaf Extract, Avena Sativa (Oat Kernel) Extract, Camellia Sinensis (Green Tea) Leaf Extract, Cocos Nucifera (Coconut) Oil, Sophora Japonica Flower Extract, Prunus Lannesiana Flower Extract, Oryza Sativa (Rice) Germ Oil, Inositol (Rice Extract), Sericin (Silk Extract), Tetrasodium Tetracarboxymethyl Naringeninchalcone, Chondrus Crispus (Red Algae) Extract, Amorphophallus Konjac Root Powder, Sodium Hyaluronate, Dextrin, Sorbitan Tristearate, Trihydroxystearin, Dimethicone, Dimethicone/vinyl Dimethicone Crosspolymer, Beheneth­‐20, Bis-­Diglyceryl Polyacyladipate-­2, Ethylhexylglycerin, Sodium Dilauramidoglutamide Lysine, Disodium Edta, Ethylhexyl Palmitate, Sodium Acrylate/acryloyldimethyltaurate/dimethylacrylamide Crosspolymer, Titanium Dioxide, Calcium Carbonate, Tin Oxide, Phenoxyethanol, Mica. 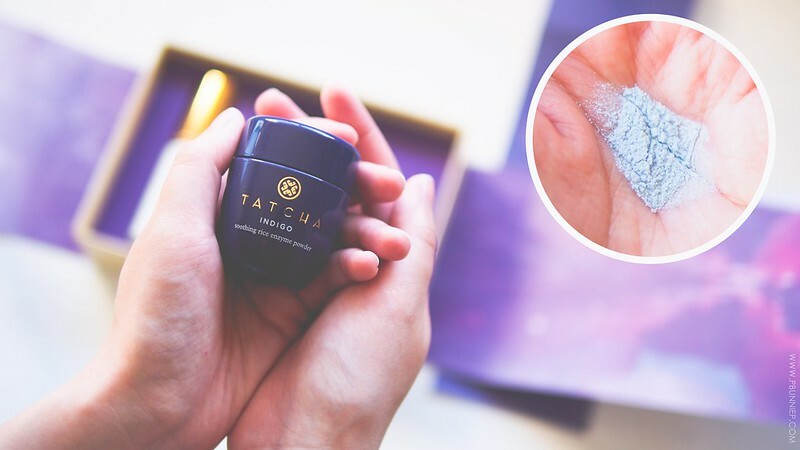 Overall, I'd say my first experience with Tatcha was a positive one and regardless of whether or not the product worked for me, I am impressed by the attention to detail and the philosophy behind the brand. The textures of the products were beautiful and I think it's easy to find a few things to fall in love with. For me, I'd highly recommend the Camellia Cleansing Oil as it is truly one of the best overall oils I've used to date (it's also reasonably priced for its quality) as well as the Indigo Soothing Recovery Cream which has been protecting my skin from the changing season. (Yes, I'm currently rationing my jar of that.) Of course certain products will be a hit or miss and you don't always get along with the popular items but if you have a skin type similar to mine, that is where I would start. Go browse!